Using the H hook, holding one white ear and one pink ear with wrong sides facing. HINT: Beginning yarn tail on the white ear is on the right. Beginning yarn tail on the pink ear is on the left. With the pink ear facing you, join white yarn with a sl st in the bottom right corner through both ears. Sc in corresponding sts around the ear to the bottom left side, placing 3sc in the top of the ear. Fasten off leaving a 12" yarn tail. NOTE: The bottom of the ear is still open. Repeat joining for other ear. Cut a wire clothes hanger on either side of the hanger. 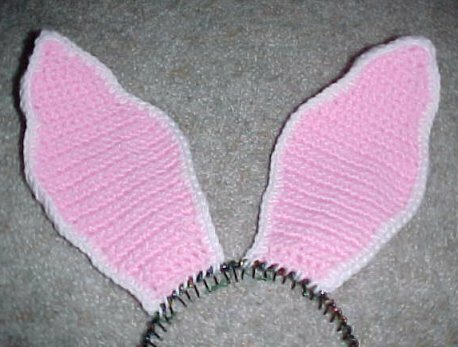 Insert one piece in between the white and pink layers for each ear. Thread the yarn tail onto a yarn needle and use it to sew the ear to the headband. NOTE: It's best to finish both ears and then position them on the headband before sewing. You can bend the wire to achieve the shape you want for your ears. I had to use floral wire to anchor the ears to the headband on the backside because the ears wanted to flop forward.